With recognition this week of five electric airplane records set by Chip Yates in flights last year, the Fédération Aéronautique Internationale (FAI) and the National Aeronautic Association (NAA) ratified performance numbers that top those of most single-engine high-performance gasoline-powered aircraft from established manufacturers, according to Yates. 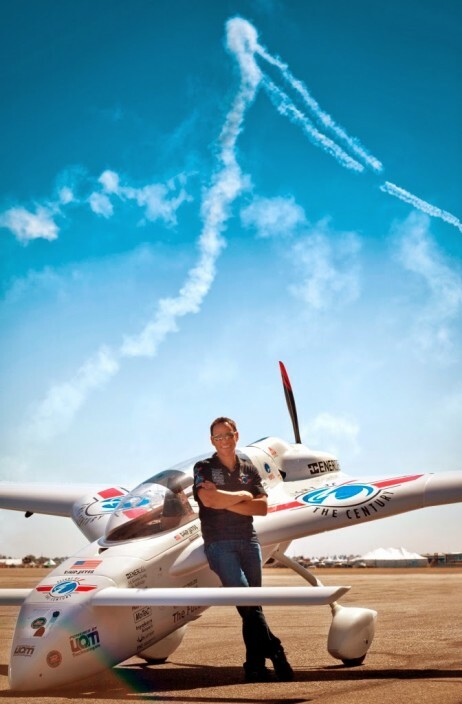 Your editor was on hand for the California Capital Airshow last October to see Chip take his Long-ESA to 500 meters (1,640 feet) from a standing start in only 62.58 seconds, 17 seconds faster than the previous record set by a fossil-fuel burner. The new records were really set last year between September and November and have just been ratified. They include an altitude of 4,481 meters (14,701 feet), a time to climb to 3,000 meters (9,840 feet) of five minutes, 32 seconds, and maintaining an altitude of 4,439 meters (14,564 feet) in horizontal flight. Chip achieved two speed records, reaching an average of 324.02 kilometers per hour (201 mph) in four passes over a three kilometer (1.86 mile) course; and averaged 225.88 kilometers per hour (140 mph) in two passes over a 15 kilometer (9.3 mile) course. His Long-ESA’s take-off weight of 1,540 pounds includes Chip, and puts the airplane into the FAI’s “C-1b Group VI” class: Electric Land Airplanes weighing 1,102-2,205 pounds. He teamed with Red, a maker of high-definition digital video cameras, to create a stunning record of his record attempts. We can only hope the full-length version shows up in IMAX theaters sometime soon. Comparing his Long-ESA with the e-Fan from Airbus Industries, Chip notes his machine has three times the power, is much faster and demonstrates greater performance in all aspects. He makes the comparison based on the fact that, “We did it all with volunteers and ZERO outside money! His pride in his all-American, free-enterprise campaign is readily apparent. Testing at China Lake Naval Air Station showed the U. S. Navy that electric aircraft have low heat and radar signatures. They’ve signed a joint research and development contract (NCRADA-NAWCWDCL-13-246) with Yates Electrospace Corporation to advance the company’s hybrid-electric stealth UAV design known as Silent Arrow™. Chip’s team continues to work on their mid-air recharging approach, with demonstrations planned in late 2014 or early 2015. Successful tests will lead to Chip’s attempt at duplicating Charles Lindbergh’s 1927 flight using aerial recharging to help him cross 3,600 miles of Atlantic Ocean. Named a “Pioneer of Aviation” by the State of California, Chip holds more than 10 patents and a Master’s Degree from the University of Southern California. Chip Yates and Long-ESA are probably destined for more records and further investigations of the limits of what can be achieved with electric aircraft.